275TH INFANTRY DIVISION (15 Sep - 1 Oct 1944 ) by Hans Schmidt, Generalleutnant a.D.
SCHMIDT joined the Army in August 1914 and was assigned as a second lieutenant of infantry in June 1915. Throughout World War I he served on the western and eastern fronts in assignments as a platoon leader, company commander, battalion and regimental adjutant. By the time World War II broke out SCHMIDT had reached the rank of lieutenant colonel and was serving in an assignment as commander of a battalion, with which he participated in the Polish campaign. After a brief assignment in Germany, he was placed in command of the 245th Regiment for participation in the French campaign, after which he was promoted colonel. In 1943, he was promoted General Major and given command of the 68th Division, on the Russian font. Transferred to France in December 194, he was promoted Generalleutnant and given command of the 275th Division, which suffered heavy losses in the Battle of Normandy and was later virtually destroyed near Aachen. 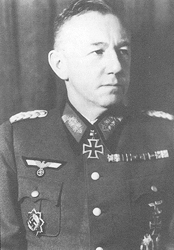 Together with his staff, the general was transferred to Germany to form a new division, with which he was assigned to the Russian front early in 1945. On 6 May 1945, the general was taken prisoner by British forces at Tangermünde. by Hans Schmidt, Generalleutnant a.D.
On 15 September the 275th Infantry Division occupied a defensive position between Meersen near Maastricht, and Valkenburg, including both of these towns. The division was on the right flank of the Seventh Army and in touch with the 176th Infantry Division, which was part of the 1st Airborne Army. The sector boundary extended from Meersen-West up to but not including Sittard. It was absolutely essential for the 275th Infantry Division to maintain contact with the 176th Infantry Division to prevent the front line from breaking at this boundary and to block the enemy's northward advance along the Maas as long as possible. This was all the more important since an enemy penetration at this point would have eluded the left wing of the 1st Airborne Army where its front faced south. Moreover, this commitment in front of the Westwall had the added objective of allowing as much time as possible for the construction of defenses at this point and for the bringing up of fresh forces. Despite the losses they had suffered during the previous day, the two weak regiments under the command of Oberst Heins and Oberst Schmitz, as well as the hastily motorized Battalion Riedel, were again available for commitment. Regiment Schmitz consisted of a replacement battalion of the 176th Infantry Division plus a Luftwaffe battalion, both newly assigned. The fighting power of these two battalions with little or no combat experience was very limited. Regiment Schmitz was committed on the right flank occupying the sector Meersen-Houthem, including both of these towns. The point of contact with the adjacent division was in the western outskirts of Meersen. Regiment Heins consisted of the rest of the division, collected into two weak battalions. Its point of main effort centered around the defense of Valkenburg where it had that day reestablished contact with the 49th Infantry Division. Battalion Riedel, reinforced with a machine-gun company, newly assigned on 14 September, was located south of Aalbeek, (3½ km north of Valkenburg), where it remained at my disposal. The division command post was at Nuth, in contact with the 81st Infantry Corps at Niederzier (north of Düren) by radio. The position's front line extended along the banks of the river Geul. Though the Geul was only a partial obstacle, this line was a better defensive position then the one which had been prepared on the hills south of the river. The latter offered no cover and could easily be overrun by tanks. The work done there was completely wasted, since the shortage of troops did not permit more then some weak combat groups to be stationed in the trenches. The battery was committed east of Klein Haasdal, with an observation post in a water tower which afforded a particularly good view in the direction of Valkenburg, the point of main defensive effort. Two antitank guns recently assigned to the division were also emplaced there. On 15 September the enemy remained relatively quiet. At Valkenburg, he succeeded repeatedly and at several points in crossing the river and in penetrating the town. Counterattacks drove him out again. The impression prevailed that the enemy was utilizing these days to prepare a new attack. He was adjusting the fire of his artillery, taking principally visible road sections under fire, as well as Heasdal and the villages situated in the foremost line. Air activity was relatively light. Enemy artillery observation planes, however, were unpleasantly in evidence. They directed artillery fire which greatly interfered with movement. The enemy activity became livelier on 16 September. Apart from a further acceleration of enemy artillery fire over the entire front, the enemy particularly attacked the left wing of the division east of Valkenburg. He succeeded in establishing a bridgehead at this point which this time could not be eliminated. By the end of the day the situation became rather unpleasant for our division. My urgent suggestion, supported by the corps and the army that the division be disengaged from the enemy during the night, was rejected by the army group commander. The position was to be held, a hopeless task according to my estimation, which only would cost us additional losses in men and material. But perhaps there were special reasons for this order which were unknown to the division. In accordance with another order the division staff was moved to Brunssum. The boundary with the adjacent army on the right, that is to say, on the right flank of our division, was changed during these days from Meersen West Sittard to a line of Meersen-Gangelt-Birgen. The left division boundary extended from Valkenburg-East via Heerlerheide to Geilenkirchen-South. On 17 September, enemy artillery activity and artillery observation flights increased in comparison with the previous day. Our division expected the large scale enemy attack to continue. To our surprise, it did not materialize until late afternoon, contrary to previous experience. His main effort, apparently, was directed at the boundary between the two armies in the Meersen area, where he at first succeeded in outrunning the battalion stationed at this point, inflicting heavy casualties upon our troops. The battalion commander was killed in action. The attack now spread over the entire front. With the aid of tanks the enemy decimated and pushed back the battalions in the foremost line. Only weak forces were left, our losses were heavy. By the end of the day our division had been pushed back approximately to a line extending from Schmimmert to Klimmen. During the night a new defense line was occupied which roughly followed the railway line from Nuth to Heerlen. The division command post was transferred from Brunssum to Waldenrath. The enemy continued his attack on 18 September. Tough battles ensued which engaged the weakened units of our division. By noon, enemy tanks had already forged ahead as far as Brunssum, which at first was hold but was yielded in the late afternoon. Contact with the adjacent units on the left and on the right could no longer be maintained. A reconnaissance unit which was dispatched to Heerlen found the town occupied by enemy forces. I assumed that the enemy, through hit thrust toward the north where almost no resistance was offered, intended to push the elements of my division committed there away from the Westwall and to encircle them. In order to check this threat and to maintain contact with the Seventh Army, my reserve, Battalion Riedel, was committed with the mission of opposing the enemy in the area south of Waubach and thus prevent him from endangering my left flank. Or 19 September the southwestern fringe of the large forest west of Geilenkirchen was held by remnants of our division. In the late afternoon, after the commander of the Luftwaffe battalion and his entire staff had been eliminated, the enemy succeeded in penetrating this front. The units became confused and retreated through the forest in the direction of Geilenkirchen. Through the personal intervention of the division commander the situation was saved to the extent that by nightfall a new front could be established on the western edge of Teveren and extending north and south of that town. In the south, northeast of Scherpenseel, the new line made contact with Battalion Riedel. In the meantime, the 183d Volksgrenadier Division with which I had already established contact during the previous day, had occupied the Westwall south of Geilenkirchen and the western edge of the town. At the north-western edge elements of that division fought a successful battle in the late afternoon of 19 September against motorized enemy units, which had advanced along the road from Gangelt. The assembly and commitment of the 183d Volksgrenadier Division in the Westwall was completed on 20 September. Its right wing was located in the Birgden area. Remnants of the 275th Infantry Division, with a total strength of approximately 400 men, had no difficulty in detaching themselves from the enemy and withdrew via Geilenkirchen to west of Linnich, where the division staff was located. These remnants became army reserve. Summarizing the above events it may be stated that our division fulfilled its combat mission for the period in question. It could not be expected that these relatively weak and partially inexperienced forces should hold the position for any length of time in the face of the major attack launched on 17 September by well-trained and excellently equipped troops. The 275th Infantry Division had been hastily reassembled for a second time within ten days and had been charged with a very difficult task. All this was possible only because the division staff as well as the regimental staffs had remained largely intact, so that with the aid of fairly strong cadres the division was able to activate new units and train them for combat. we were continually improving and organizing. Still available remnants had to be reorganized into new units with the aid of personnel reassigned from straggler assembly points and had to be committed without delay, Weapons and ammunition showed a corresponding lack of uniformity or adequacy, Here again we had to improvise. Every opportunity was utilized to train the troops in the use of weapons and to improve their combat morale. that all these efforts showed gratifying results can only be attributed to the untiring labours of all officers and noncommissioned officers. The performance of these units, often composed of members of all arms and branches of the service was above praise. The enemy was stopped short of the Westwall near Geilenkirchen long enough, though with heavy casualties for our side, to permit the 183d Volksgrenadier Division, intended for this sector and still in the process of assembly, to completed its preparations for taking over the defense.